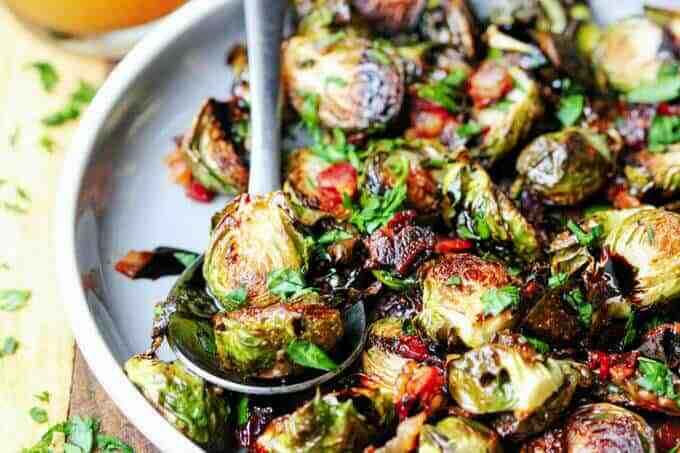 Balsamic Glazed Brussels Sprouts with Bacon is a perfect side dish for any Holiday meals. 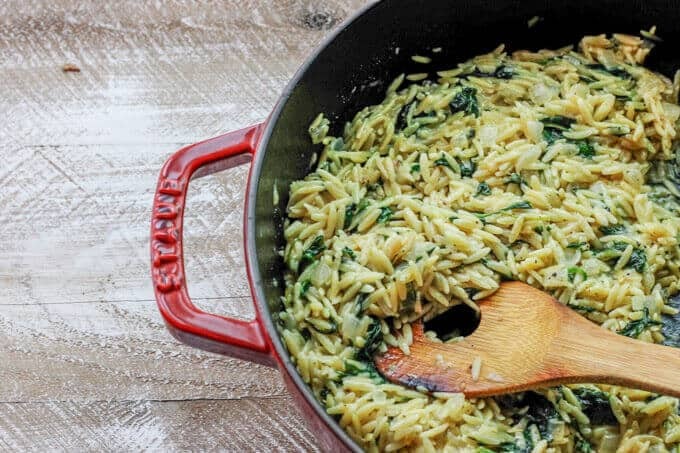 It can be done in just 20 minutes while your turkey is out of the oven and resting. 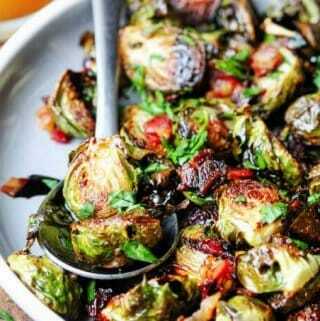 This Balsamic Glazed Brussels Sprouts with Bacon will convert any sceptic into a happy brussels sprouts eater for sure! I know this, because my husband is the worst when it comes to “cabbage-like” vegetables. It needs to be done well and it involves copious amounts of bacon. 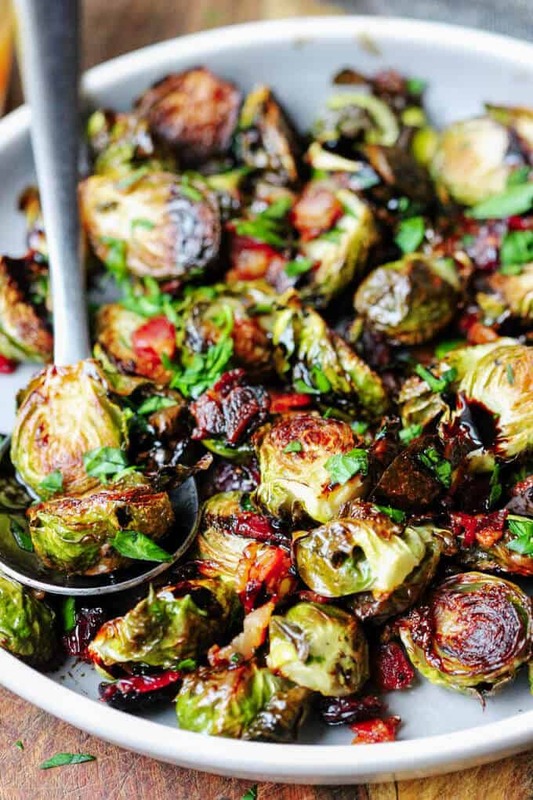 These brussels sprouts are roasted with bacon in the same sheet pan for 20 minutes, then drizzled with a balsamic reduction, and finally sprinkled with dried cranberries and parsley. 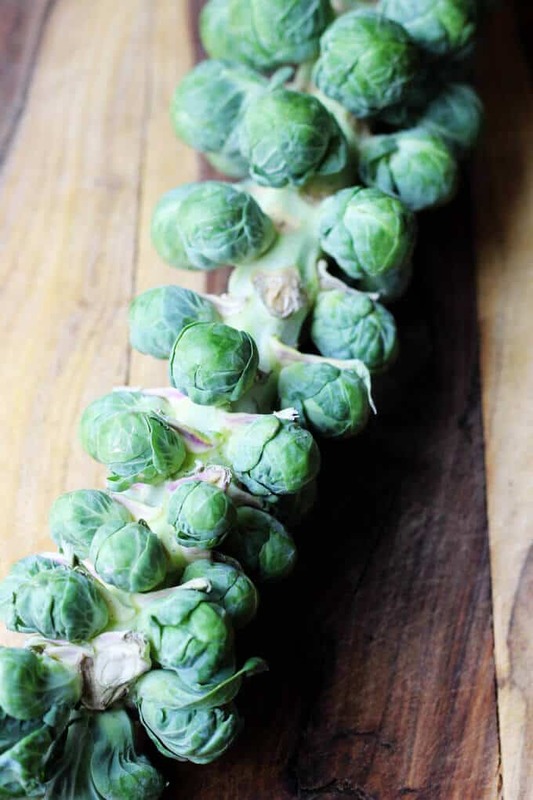 You’ll find that the sprouts come out crunchy and slightly browned. There is no mushy-mush involved (which is also key for your resident skeptic). 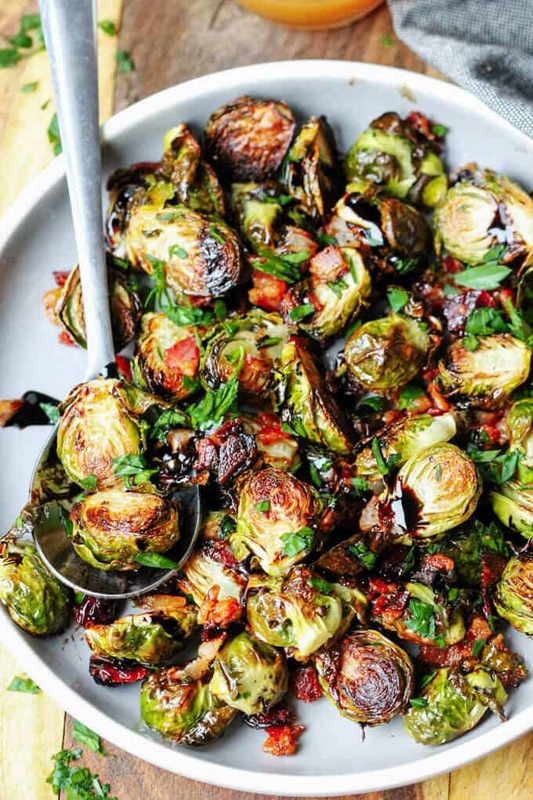 I’ll be totally honest here….I despised brussels sprouts when I was a kid. 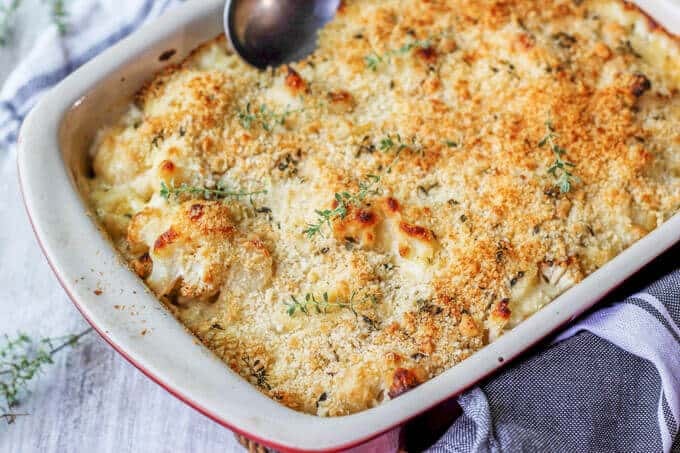 In hindsight, I now know that the reason behind it was exactly the same as the reason why I hated a cauliflower, which btw I cannot live without right now (check out these recipes for affirmation: Whole Roasted Cauliflower Mediterranean Style, Roasted Cauliflower Soup with Smoked Paprika & Coconut Milk or Cauliflower Pasta Bake with Brie & Fontina). I don’t know why it is, but in Poland it seems that all the vegetables were OVER COOKED. So both the cauliflower and brussels sprouts were a total uneatable mush. I’m sorry Polish cuisine; I love you, but here we differ. I do not like mush! Perhaps I’ll rethink this preference when I turn 90. Apologies, that was a bit of tangent. Coming back to my dish. Here you’ll find that the bacon bits are salty and crunchy as well. Then the sweet balsamic glaze brings the whole dish together. I added an extra sweetness from dried cranberries, just because I like them, and freshness from the parsley to brighten up the dish. At this point my husband is actually excited when I make them. Can you believe that? 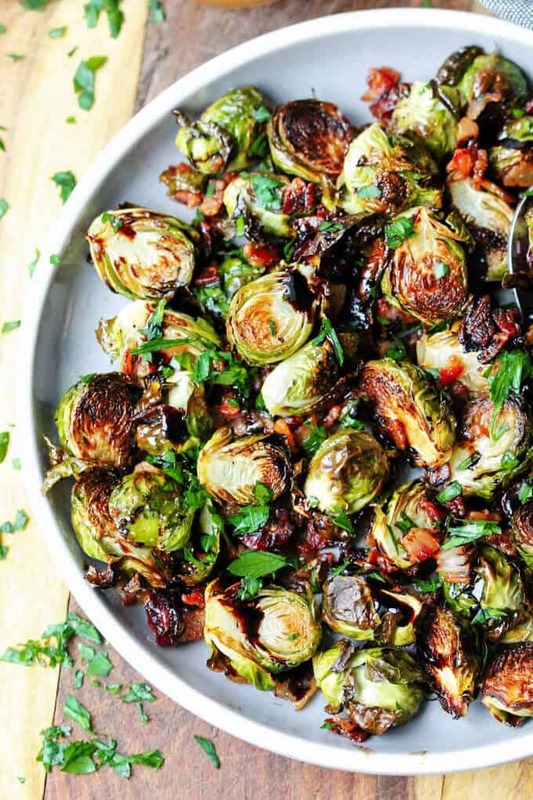 This dish was inspired by Ina Garten Balsamic-Roasted Brussels Sprouts. She made hers with pancetta and thick balsamic. But I love my Trader Joe’s Balsamic Glaze. 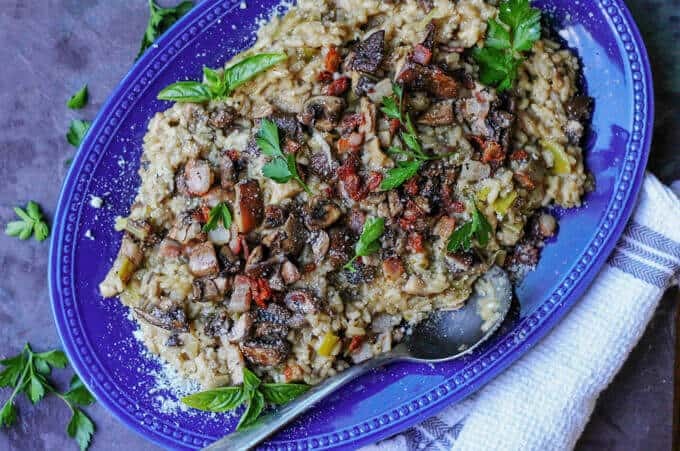 It is super delicious and I don’t have to dirty any pots for reducing the balsamic. But if you can’t find a store bought Balsamic Reduction, just heat up 3 tablespoon of balsamic vinegar and reduce in half until thick and sticks to the spoon. Ina also used extra olive oil for roasting the sprouts with pancetta, but I skipped this step as the bacon produces enough fat. Check my favorite Thanksgiving recipes. There you go – I guarantee you’re going to have an epic Thanksgiving Day feast and very satisfied family 🙂 Trust me on that! I’m so excited that the Holidays season is here. 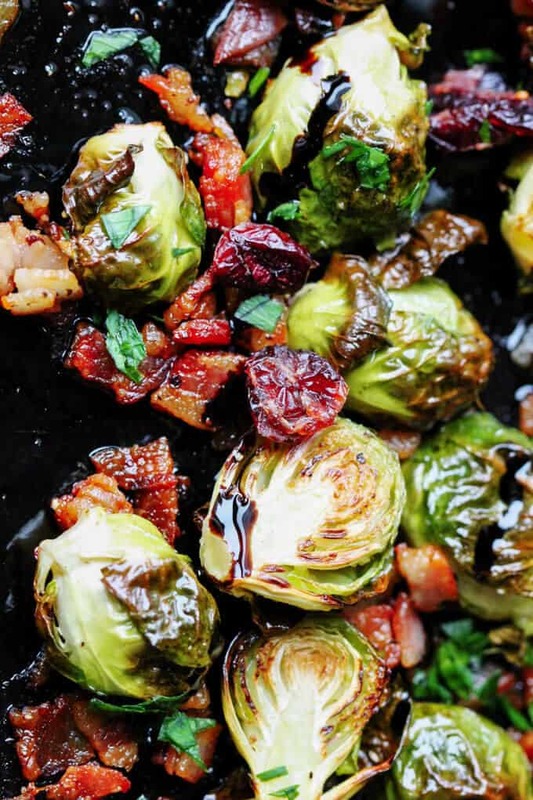 Balsamic Glazed Brussels Sprouts with Bacon is a perfect side dish for any Holidays. It can be done in 20 minutes while your turkey is out of the oven and resting. Roast in the oven for 20 minutes. Mix twice during roasting: once after 5 minutes to distribute the bacon fat and then after 15 minutes to flip Brussels Sprouts on the other side for the remaining time of cooking. Remove from the oven, place on a serving dish, sprinkle with cranberries, parsley, and drizzle with Balsamic reduction. Serve immediately. 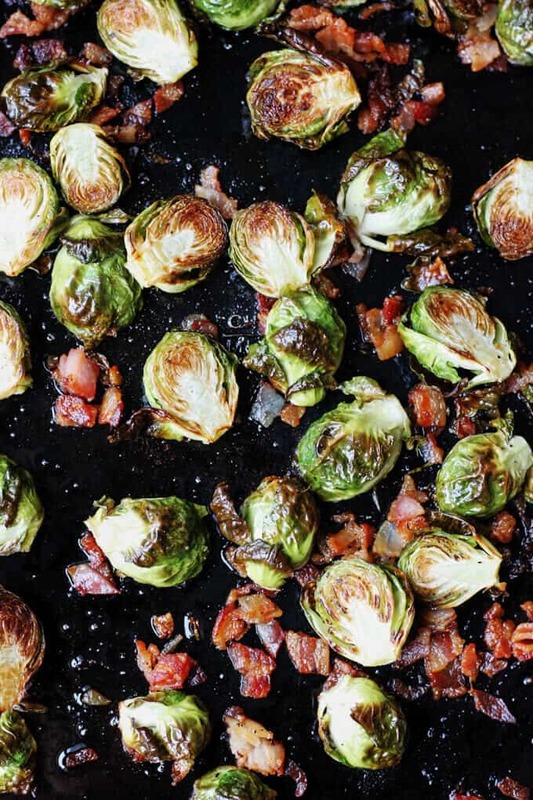 This recipe is for 25 brussels sprouts cut in a half (5 per person); and 4 bacon slices (1 per person). 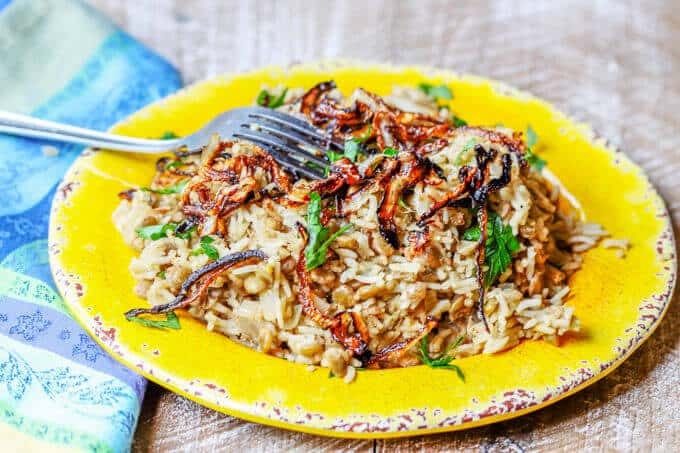 If you don't have Balsamic Reduction, heat up 3 tablespoons balsamic vinegar in a small saucepan and cook until reduced by half and sticking to the spoon. This veggie platter is so bright and colorful! I could definitely fill half of my plate with these! I love balsamic! These look amazing with it!! YUM! They are really good with balsamic! Yes!! 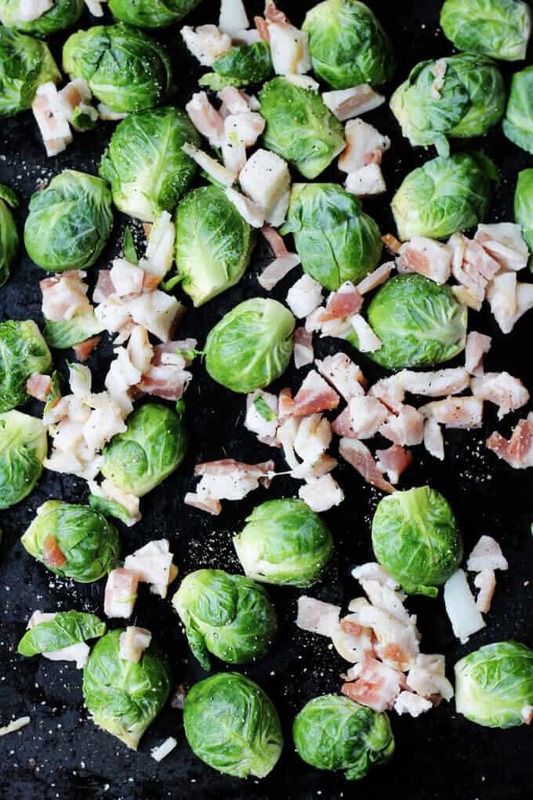 Bacon and Brussels Sprouts are the best combination ever! 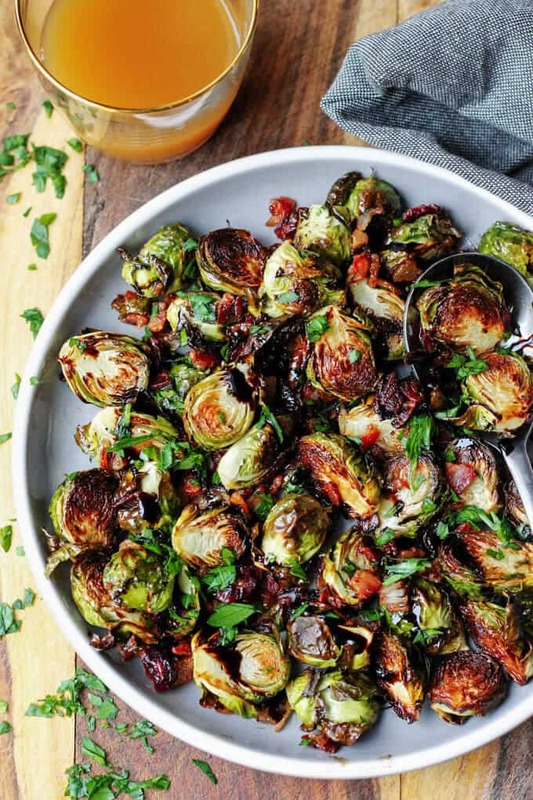 I have fallen in love with Brussels sprouts and this is really a nice recipe with it’s balsamic reduction. I’m sure you will like it Ginny!